Mildread XII features a pneumatic hanging system with custom designed hooks and a 6 plaction wheel drive train with CIMple gearboxes. 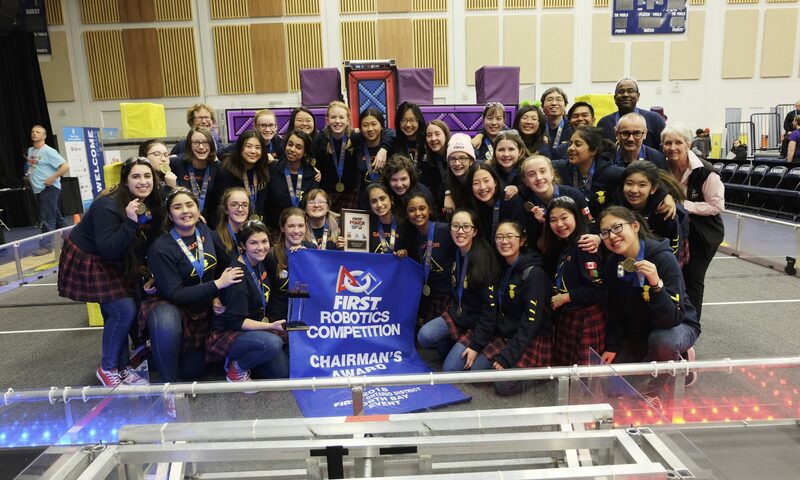 The robot receives points by successfully raising and lowering the arm to hang on a 30″ high bar, and completes the additional task of scoring points by dumping frisbees into a goal using a Lexan dumper located on the side of the robot; it can store up to four frisbees at one time. Mildread XI features a 6 wheel drive train with CIMple gearboxes. A polycord elevator system brings the basketball up to the shooter. The shooters are made up of 4 flywheels with a turning range of 360 degrees. The camera is able to track the reflective tape on the hoops and adjusts the shooter accordingly. 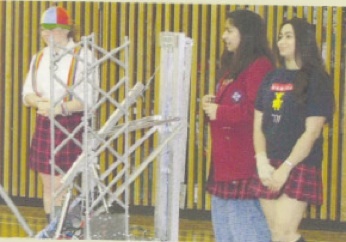 The back of the robot carries a bridge lowering mechanism with a dummy wheel at the end to help successfully cross the bridge. Mildread X features a four-bar parallel linkage arm, which reaches up to ten feet. The arm also has a roller gripper and this lets us roll the tubes in and out as well as adjusting the angle of the tube up and down. 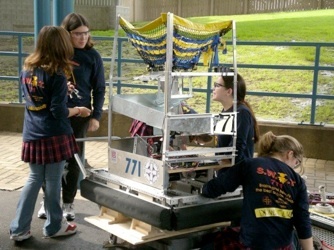 The drivetrain uses a shifting gearbox so the robot can drive with control and speed. 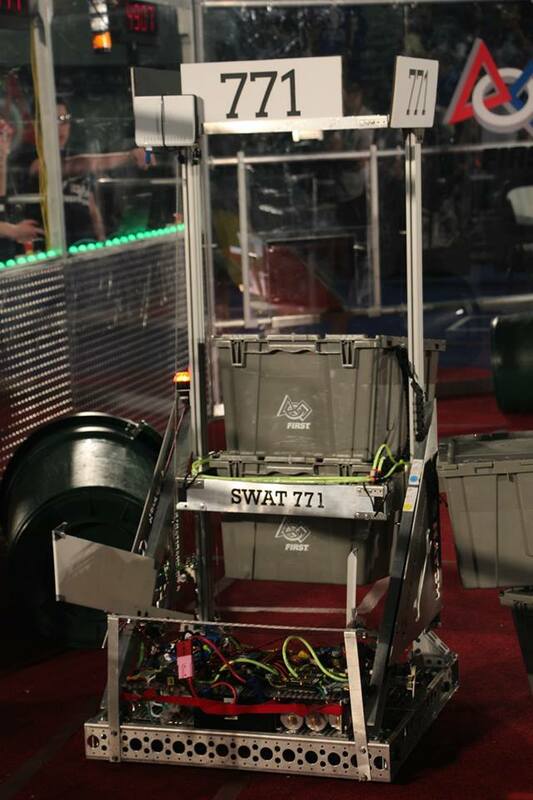 This robot is compact so as not to flip over while we go over the bumps. 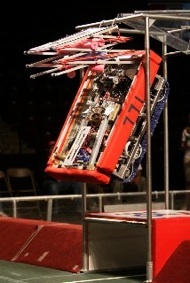 The drive train is a continuous track to assist the robot when climbing bumps. 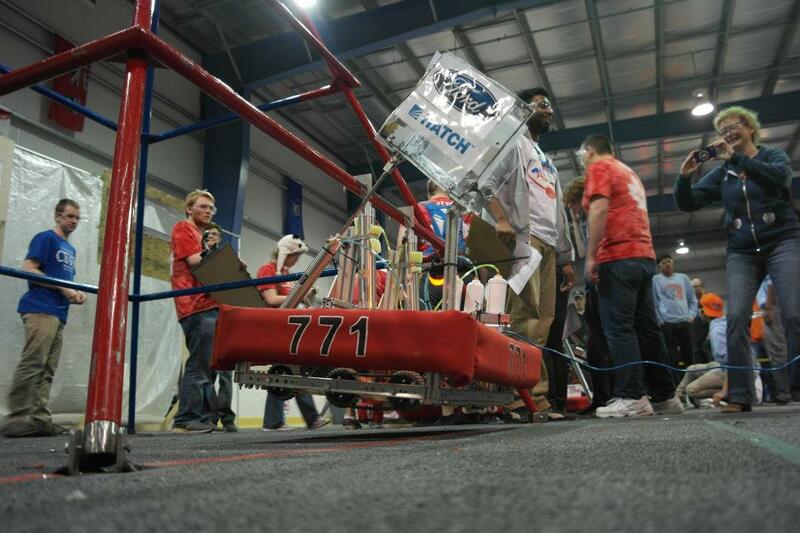 Our robot has two main functions, the kicker, and the arm. 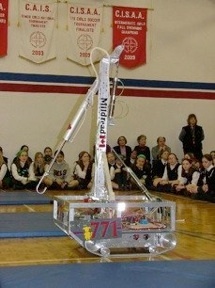 The kicker uses surgical tubing and a track to transfer energy to the ball. For the arm, use a scissor-lift design with more surgical tubing to allow the robot to lift itself. 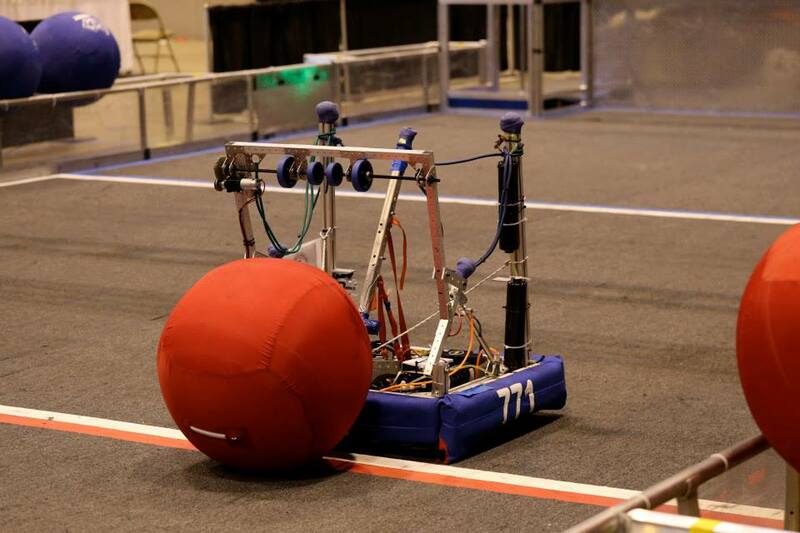 This robot dumps orbits balls to score points. To do this we built a dumper with a tilted wooden bottom and an open top. There is a pneumatics system attached to the door in the front that pulls the door down to release balls and pushes it back up to contain them. 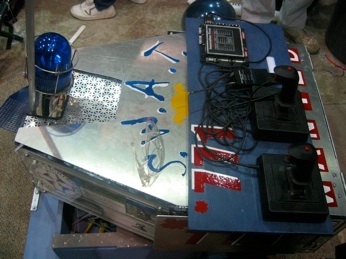 On the front of the robot, we also have a claw-like device that moves up and down to trap empty cells for easy transportation across the playing field. This robot is designed to knock exercise balls off an overpass in FIRST Overdrive. 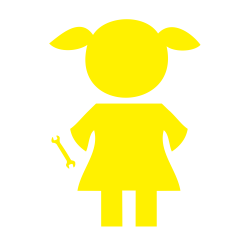 It uses a pneumatic system to deliver a powerful punch. It has caster wheels on the back to allow the robot to be easily steerable. 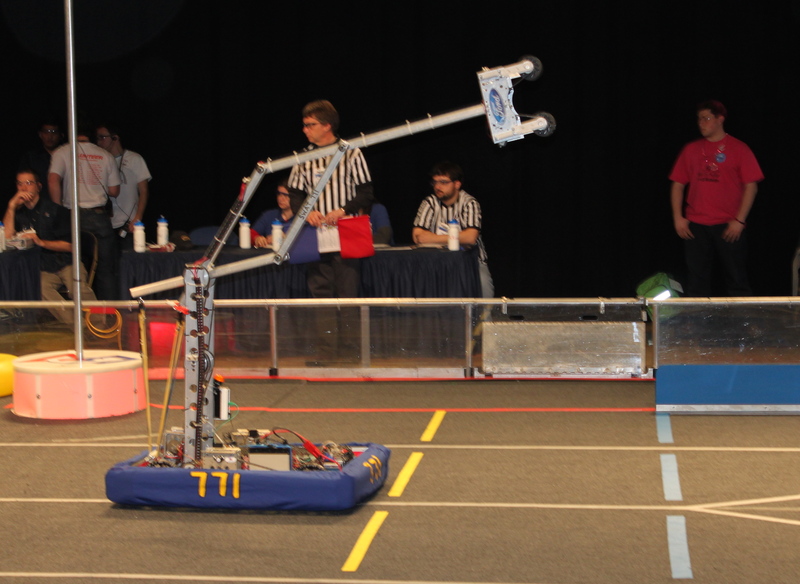 This robot has two functions that changed through regionals. 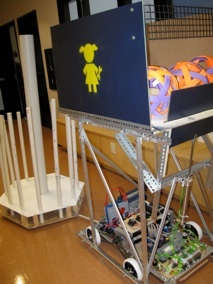 One function was the arm to pick up balls and place them on the rack to score points. 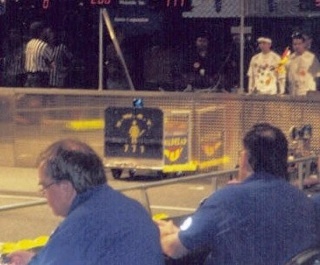 The other function was a ramp that could support two robots one foot above the ground for bonus points in the last twenty seconds of the match.